I am torn about this book. A large part of it involves following Remy into an alternate reality. 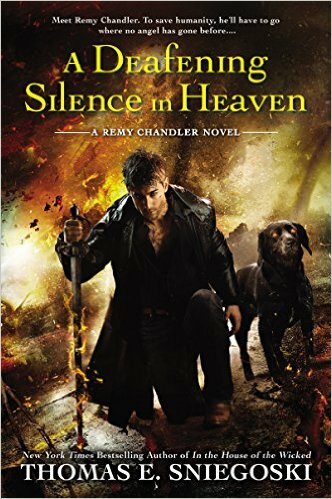 No, let me reassess that – nearly every part of this book, certainly every really relevant part of this book involves Remy in an alternate reality. And… this is book 7 in a series and nearly all of the book was… kind of irrelevant to the overarching series? All the action, the people they met, the foes vanquished, the darkness faced is, at best, a cautionary tale for the main series. All of the action in the book is, at best, a warning for what could happen, a prequel, more than the actual story itself. It doesn’t help that one of the main twists of the last book and another source of conflict is so… downplayed. The Bone Assassin’s attack on Remy seems to come from a very mundane source. I’m not going to spoil it, and it’s certainly an unexpected twist but, again, it’s another major plot element that doesn’t really seem to fit into the overall scheme of the series. This gives me the odd feeling that the whole book is a time out, an intermission between the main plot, maybe even a new prologue for the new major plot line. I suspect the latter mainly because of the whole burgeoning storyline of the Unification. The plot of God forgiving Satan and the Fallen Angels and reunifying the broken lands of Heaven, Hell and Eden is clearly going to be an immense, incredible storyline. Which may be the purpose of this book – while it’s not directly contacted to the main storyline of the series, it is there to tell us what is at stake. This is the worst case scenario. This is exactly what could happen if the following plot lines go wrong. This is just how terribly wrong Unification could go. This shows that, while Unification may be a wonderful, shiny thing, it also takes a whole lot of effort and there is immense risk connected to it. This also shows that, yes, there are actually people out there who are clearly, eagerly willing to ruin everything, literally everything because of their own issues. As well as more than a few people who are not ready for the big bad guys to be forgiven – not at all. This all links nicely with Squire’s backstory and the suggestion that we have many many many many worlds have completely fallen apart. It’s all at stake here. Then we have the b-plot of the Bone Assassins which also adds nice twist; so while we’re all foreshadowing the big mega awesome plot line to come, there’s also this nifty reminder that small things can ruin everything. It doesn’t take an epic force beyond imagining to completely ruin everything – even simple, insignificant little interactions can really ruin your day. Expect the epic, but don’t ignore the little things. And it does this with a huge world, an epic cast of characters, some excellent personalities and a really fun, deep and interesting core team. I like them a lot, I like the richness of the world a lot. It’s huge it draws upon so many Biblical myths and I could just chew on it all day. If there’s one downside to all of that it’s that there’s a whole lot to remember which means, especially after the gap between this book and the last – characters like Simeon, or organisations like the children of Samson can take a moment to remember. I rarely say this, but this book could actually use some recapping, it really could. Firstly, let’s look at gender. There are three prominent women in this book – Linda (Remy’s love interest) and Ashley (Remy’s friend) and an alternate world Child of Samson (who exists to establish a quick and sad relationship so she can then die and it be super sad – because a dead woman who gets to play child-like figure to the manly man is much more tragic than a man dying – that whole precious pedestal jewel trope). Oh we have some random bit parts (including a giant pregnant female monster that eats people which I’m not even going to touch except say “giant pregnant female monster that eats people”) but his is the crux. Everyone else is male. And it’s not just a case of a skewed male cast – their roles are blatant as well. Take Remy being unconscious while his mind wanders the alternate dimension – to save him we call up Ashley and Linda to do some emergency cuddling (along with his dog). Yes, they will cuddle and their super-duper love will saaave him (apparently, I mean it – and they – don’t actually seem to do anything at all all book except be sad and cuddle but this supposedly achieves something). And hey, close friendship and love anchoring a soul? I can run with that. But Steven has been Remy’s friend for waaay longer – and Francis has been his friend and confidant for several human generations – why are none of these menfolk making with the life saving cuddles? Would that be rigid gender roles and homophobic terror of male intimacy? Why yes, I believe it would be. Meanwhile the men, who are not lying on a bed doing some vital cuddling, are fighting and killing and making quips and generally kicking arse and apparently doing something. We have one tiny cameo appearance by a character who was established as gay in a previous book (but there’s certainly no indication of it in this book). This is not inclusion. We have a similar cameo appearance from a Black woman (who is at least indicated as such) and a very briefly appearing Samson who is a POC. The most prominent Black character is Assiel and angel… an angel of healing. And sacrifice. Guess what happens to him? There is another POC who is more prominent but due to his condition is only actually revealed as dark skinned towards the end of the book. The lack of inclusion in this series frustrates me immensely. It frustrates me more than many books – it frustrates me more because the series is so huge and contains so many characters that it is all the more glaring. And it frustrates me that I love this series so much and it has this massive inexcusable hole in the middle of it.